Mary Elizabeth Phillips arrived in San Francisco as a war bride in 1937 – the same year the Golden Gate Bridge finally opened. After spending 50 of those years at her Dolores Street apartment, Mary may lose her home come April. She was one of several tenants served with an Ellis Act eviction notice April this year, just after her birthday. The new property owners, Urban Green based in San Francisco, has new plans for the building, according to Mary’s neighbor, Sarah Brant. Brant said there was an effort to pay tenants to leave, but with a pretty big catch. An elderly couple is on the brink of being forced out of a place they have called home for 34 years under an obscure state law called the Ellis Act, and tenant advocate groups rallied on Wednesday to show their disappointment. "Even though this place is old, I have a lot of memories here," Gum Gee Lee told NBC Bay Area through a translator. "It's my last day in this house and I don't know where to go." Christie Smith reports. It’s the same story all around San Francisco, including in North Beach where Theresa Flandrich has lived for many years on the 500 block of Lombard Street. They paid their rent on time for years, maybe decades, and got along with both neighbors and the landlord – but they’re still getting evicted. Stephanie Chuang reports. But attorneys involved with helping these tenants facing both evictions and buyouts said it’s clear the incentive is profit. For instance, Mary pays less than 1,000 dollars a month for her rent controlled two-bedroom apartment. Down the street at a new development, another two-bedroom is going for almost 4,000 dollars. Flandrich’s situation is similar with nearby one- and two- bedroom apartments renting for up to four- and five-thousand dollars a month. Steve Collier with the Tenderloin Housing Clinic, which helps the elderly, disabled and low-income families, said these buyout offers are usually happening under the threat of what’s known as an Ellis Act eviction. The Ellis Act is a state law that was designed to allow a property owner to leave the rental business, thereby vacating rental units. Collier said it’s a law that’s being heavily abused since the city started to experience a turnaround from the recession. He added that most of the property owners behind the move are real estate speculators, hoping to flip these apartments into an easy profit at the expense of the people who’ve lived there for decades. “What we’ve seen is groups of investors are banding together to buy property, usually it’s when a landlord dies and it’s sold as an estate sale, or when someone just wants to sell to retire and then the speculator buys the property evicts the tenants by using the Ellis Act,” said Collier. He said the speculators use a loophole to bypass a ten-year moratorium on converting apartments into condos that was enacted in San Francisco in the summer. Tallying up the San Francisco Rent Board’s monthly statistics shows a significant spike in the number of units evicted under the Ellis Act. In 2012 through September there were 104 units evicted. For the same period this year, that’s nearly doubled to 200. 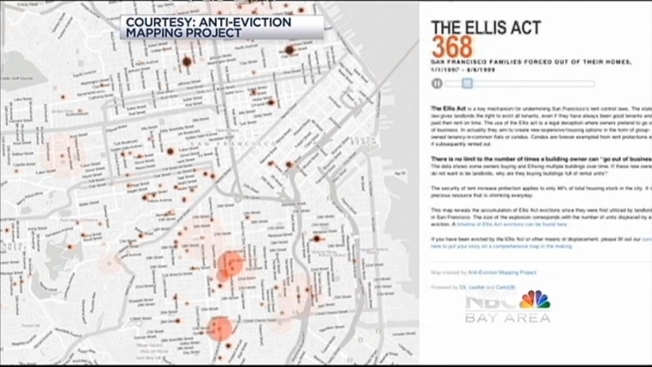 The San Francisco Tenants Union set out to map out all the Ellis Act evictions in the city since January 1, 1997 and came up to 3,705 through August 2013. So why even offer the buyouts? There’s a major difference in what the landlord or property owner can do depending on whether a tenant accepts a buyout or is Ellis Act evicted. With the eviction, they must pay relocation fees at 5,210.91 dollars per tenant with an additional 3,473.93 if the tenant is elderly or disabled. If they want to rent out that unit again, they must offer it back to the original tenant at the rent controlled price for the first five years after the eviction, and then at market rate the following five years. By comparison, if tenants take the buyout, which is usually double the relocation fee, the property owners can rent out that unit at market rate right away. But Janan New, executive director of the San Francisco Apartment Association which helps rental property owners, said it’s been an unfair discussion and should be focused also on being fair to people who have rental properties as a money-making opportunity. New added that the Ellis Act is the only tool available to the people she works with, allowing them to exit the rental property business and hold onto any control should tenants refuse to leave. For those who said they’re getting forced out of their long-time homes, it’s about weaving humanity into the process. Flandrich believes this trend is killing the fabric of what has made San Francisco unique. For Mary, having to leave her Dolores Street apartment means having to leave the city she’s lived in for 76 years because rent in San Francisco is simply too high. But the 97-year-old is holding onto some hope – and humor. The owners of the properties mentioned in the story, including Urban Green, declined to comment.